I made these ones for a 1 year old's party as her middle name is Rose but didn't want anything too kiddy. 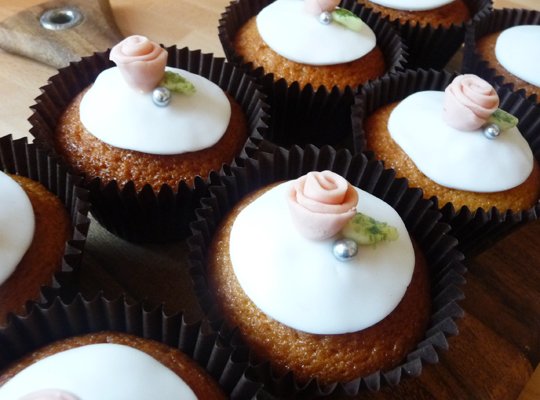 These would be welcome at girly gatherings, tea parties or even wedding cake material. The roses are not difficult to make once you have the hang of them. Ingredient quality really makes difference to baking. I've experimented with lots of butters and you can tell the difference - buy the best! The white eggs* here are from The Happy Egg Co. whose ethos I like and these are laid by white hens. They have a larger yolk than normal so fabulous for baking with. I also wouldn't be without my beloved OXO Good Grips tools to help me either. You can read more about my product reviews here but they are my go-to for everyday, affordable kitchenware. Here I'm testing the sturdy mixing bowl* which is exactly what I want; 1. stainless steel, 2. non slip, 3. well weighted. It's perfect and the white exterior is modern and good looking for display (great for speedy chilling too). 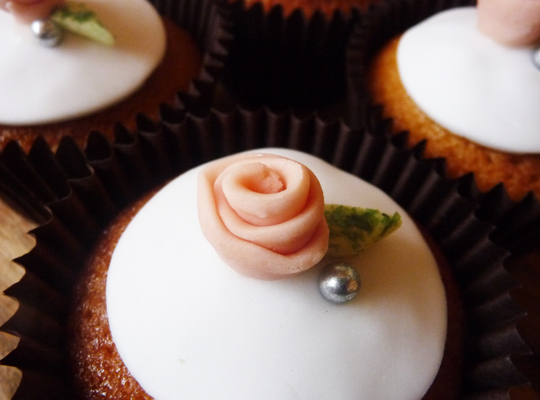 I was also testing the decorating set but had the rose decoration in mind. I've never got on well with icing kits, either the simple snipped bags or those impossible traditional metal plungers that spew icing out of the sides. 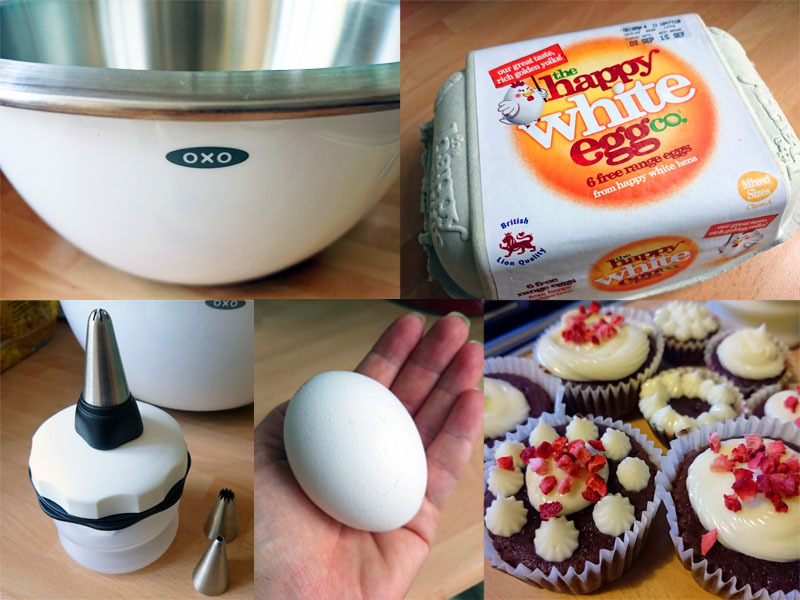 The OXO 4 Piece Baker’s Silicone Decorating Bottle Kit* may look a bit bonkers but it was so easy to use and handle. No spills or mess either. The compact nature is a bonus as everything can be stored inside. Even after a quick test, I know I'll be packing my old icing kits off to the charity shop in the morning. Pre-heat the oven to 200C/fan 180C/gas 6. Line a muffin tin with 10 muffin cases. Beat together all of the cake ingredients for a couple of minutes until you have a smooth batter. Divide between the muffin cases and bake for about 15 minutes, until risen and golden. Remove from the oven and cool completely. Cut a third of the icing off and reserve. Dust the work surface lightly with icing sugar and roll the larger icing block out thinly, flipping and turning to ensure it doesn't stick. it needs to only be about 3mm thick. Using the round cookie cutter that is a little bit smaller than the finished cupcake, cut 10 circles. Cut a third off the smaller piece of reserved icing. Put a few drops of red colouring onto the larger piece and a few drops of the green into the smaller piece. Go easy as you want a soft pastel colour. Work the colour into each icing until you have a smooth, even colour. Chill this for a little while if it has gone too soft with the heat of your hands. Once ready, lightly dust the worktop with a little icing sugar and roll each colour to around 2.5mm thick. For the rose colour cut into thin strips about 10mm tall and 100mm wide. Roll these up slightly unevenly to form the look of a rose. Slightly pinch the bottom to form a "v" shape and to hold it all together. Trim the end point so your rose sits on a flat surface. Repeat until you have 10. Cut the green icing into 10 small leaf shapes then using a blunt knife, press lightly to form the central vein. Tip a little of the glitter onto a plate and lightly press each leaf into it. Pour cold water into a small glass. Dip a pastry brush in an remove excess water with some kitchen roll. Lightly paint the underside of the white icing round and press centrally on top of the cupcake. Using a small clean, unused artist paintbrush, dampen the underside of each green leaf and apply slightly off centre to each cupcake. Repeat with the base of each rose and stick centrally. Apply a single silver dagree. *I was sent the products for review. Words and content, as always, are my own.